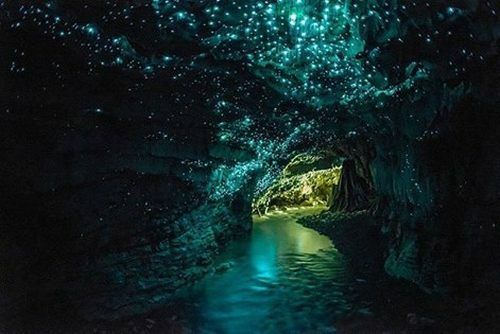 A number of booking sites are showing flights from Calgary to Auckland with Air New Zealand for as low as $632 CAD roundtrip including taxes. 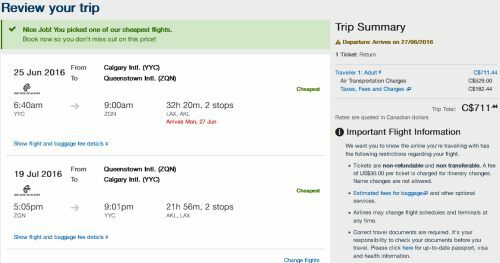 If you're up for taking a really long trip to New Zealand, there also seems to be flights from June to, say, November 2016 available for $598 CAD roundtrip including taxes. It doesn't have to be November that you return though. When testing it out, you can try changing the return date on Kayak to a date in August, September, October, November, or December 2016, or January, February, March, or April 2017, and you still have a good chance of finding flights for $599 to $632 CAD roundtrip including taxes. You can also find flights from Calgary to Sydney (SYD) or Melbourne (MEL), or the Gold Coast (OOL) or Brisbane, Australia in the $900s CAD roundtrip using this same method. It's nowhere near as crazy as the prices to New Zealand, but still cheaper than usual. For the flights to Australia, in some cases it looks to be possible to book them by going directly from Kayak to the Air New Zealand website. Other cities in New Zealand: Calgary to Christchurch (CHC), Wellington (WLG) , or Queenstown (ZQN) are available for $711 CAD roundtrip including taxes. Try substituting these cities on the Kayak searches above. Click through from Kayak to Expedia. calgary, yyc, flight deals, auckland, new zealand, akl, air new zealand, australasia, oceania, christchurch, chc, wellington, wlg, queenstown, zqn, nelson and nsn. 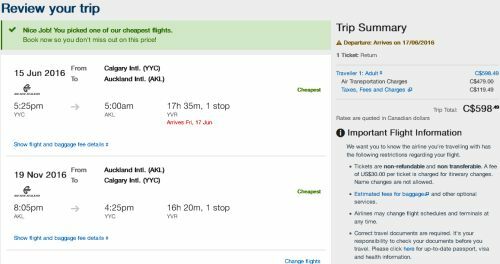 2 Responses to "Calgary to Auckland, New Zealand - $632 CAD roundtrip including taxes"
Anyone got this crazy deal? Crazy deal but keep in mind you'll be going to NZ in the dead of winter there. They don't have central heating in a lot of places so it's likely to be pretty chilly indoors, even if the outside temperature is mild by Canadian standards.